Greetings Attack on Titan fans! Nico Live is bringing you two Attack on Titan webcasts this week! If you're a fan of the manga or anime, you owe it to yourself to watch these exclusive programs dedicated to enthusiasts! Click the titles below to head over to the watch page and timeshift 'em! Escape From A Super Titan's Stomach! During a regular-scheduled announcement of a real escape game here at the Nico Live Studio, a colossal titan suddenly appears! Before the terror-stricken staff is able to come to terms with what happened, the entire studio is swallowed by its gaping maw! You have 15 minutes and the clock is ticking... That's 15 minutes left to escape the belly of a colossal titan before being digested! Solve all the puzzles of the colossal titan's belly and escape! 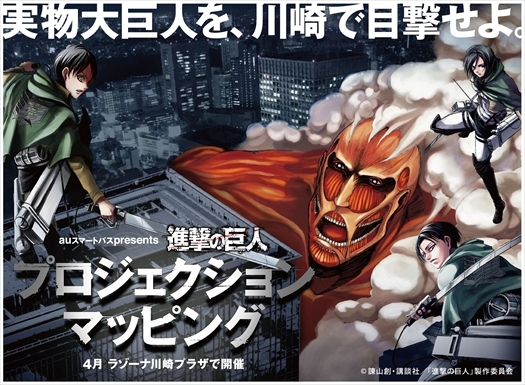 Through projection mapping a life-sized will appear and Eren, Mikasa and Levi will be there clad in 3D maneuver gear to take it down! This program lets you enjoy the action in real time even if you can't be at Kawasaki in person! * Premium members can watch a timeshift of the above program.